The Survival Hax Tactical Credit Card arrived in a small box, about 4×6 inches. Included in the box is a pamphlet detailing every item that is contained in the Tactical Credit Card. Right out of the box I was pleasantly surprised by the durability and multi-functionality of the Credit Card. The opener and knife look like they would be useful in everyday situations, but the firestarter, tweezers, and paracord could be life saving in an emergency. This is a very unique item that I would be really glad I had in my pocket if SHTF. In one compact package you would have the tools to start a fire, cut whatever you want, figure out what direction you are going, open bottles, and unscrew flatheads and hex bolts. That is a lot of use for small rectangle that only puts you down $12. The ability for every piece of the Tactical Credit Card to fit in (and stay in) one small package is very nice. The knife is very sturdy even though it is thin. The magnifying glass is significantly more powerful than I thought it would be and looks like you could start a fire in intense sunlight. The compass is also impressive despite its small size. The fire starter works and so does the opener. The knife sharpener is a key addition. A dull knife in a survival situation could be deadly. The whistle is extremely loud and shrill and the paracord is sturdy. The Survival Hax Tactical Credit Card is a great idea and very handy to have around. However, the design has a little to be desired. It did not fit at all inside my wallet (which is a trifold) being too thick and too wide. It might fit into a bi-fold wallet but it would still be too bulky and uncomfortable to sit on. The knife is uncomfortable to hold/use but is razor sharp and serrated. The whistle and paracord are not contained in the Tactical Credit Card; i’m not entirely sure why they were included. The toothpick and tweezers are plastic and extremely flimsy. The individual components of the Tactical Credit Card are worth your money. When SHTF, having one of these in your pocket or in your bag would help your survival considerably. The card, however, is not practical to be used in a wallet and carried around daily. 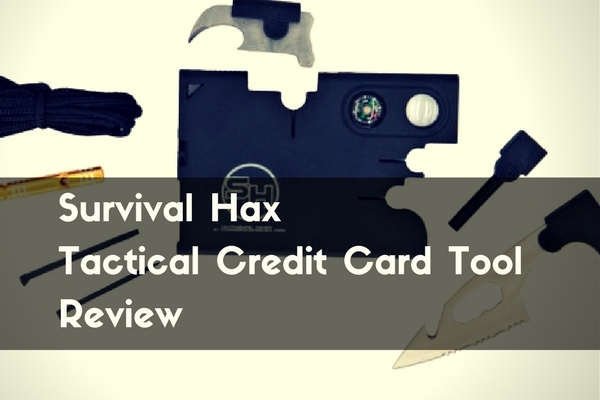 At TruePrepper, we recommend the Survival Hax Tactical Credit Card as a cheap, portable, survival toolkit. 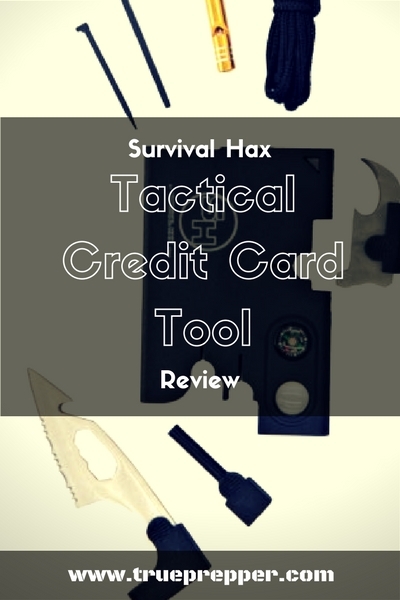 Survival Hax provided TruePrepper with the tactical credit card tool at no cost so we could conduct our review. Our disclosure statement is here, and on the bottom of every page.